I’ve been eating fluff my entire life, though I never actually called it that til recently. To me, fluff was always known as “that green stuff” or “the red stuff Aunt Barbara makes.” Regardless of the name, I love it. 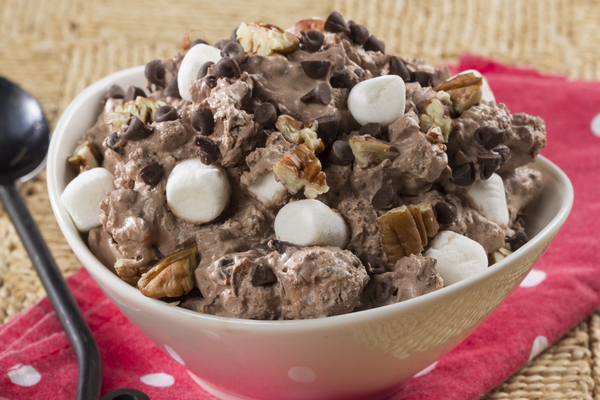 And it’s one of the easiest things to make, so I’m gonna show you how with this totally decadent recipe for Rocky Road Fluff. 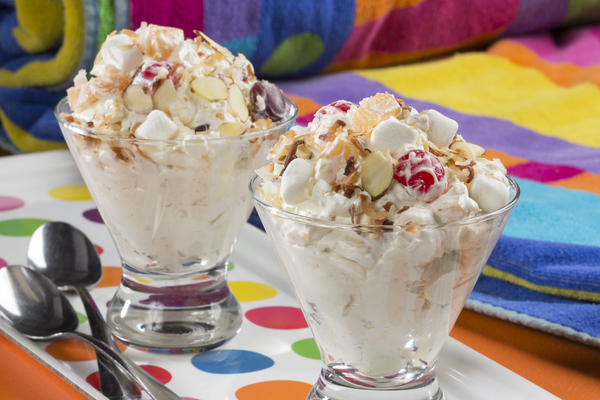 There are 2 key ingredients to making fluff: frozen whipped topping and flavored pudding mix. These two things make the light and creamy substance, which holds the whole recipe together. 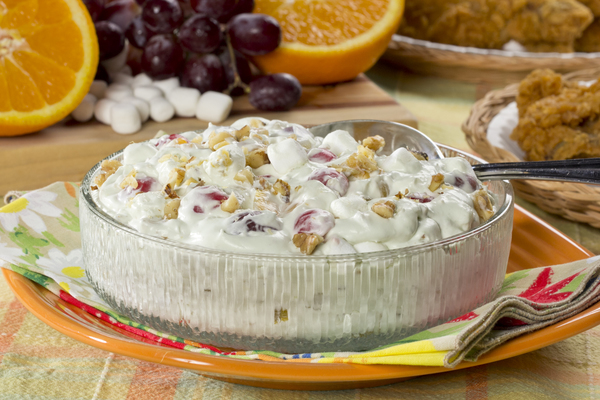 As a general rule, you’ll want 1 package of pudding mix to 8 ounces of whipped topping. So, once you’ve picked your flavored pudding and add-ins, mix it all together and chill until ready to serve. Here’s the only tricky part, mix the pudding mix and any wet ingredients first. 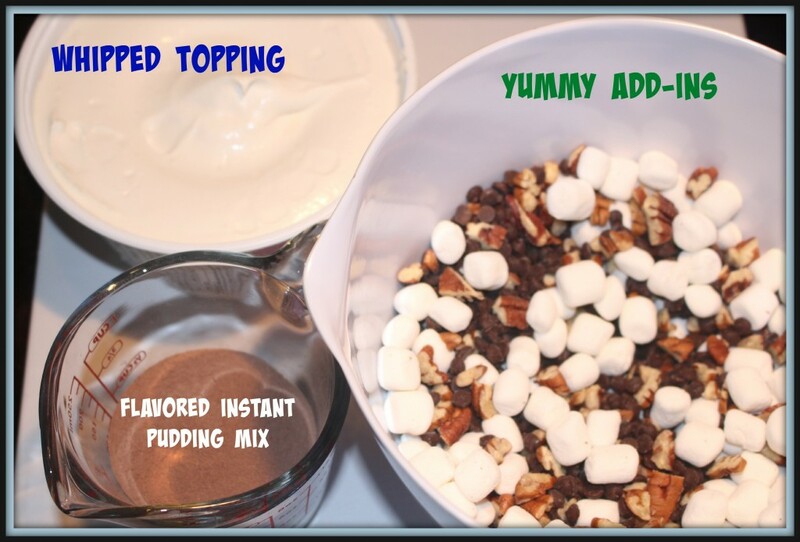 If you didn’t choose an add-in with liquid, you’ll need to add a cup of either water or milk to the pudding mix. This will moisten and thicken up the pudding mix. 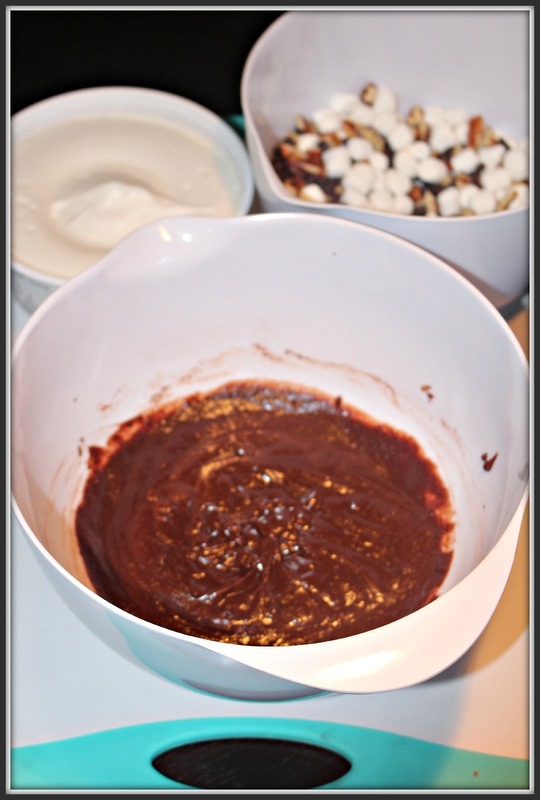 After the pudding mix is thickened, stir in thawed whipped topping and other dry add-ins. Then sitck it in the fridge to chill. I usually let my fluff chill for 2-5 hours, though you can eat it immediately if you’d like. In this recipe, the combination of chocolate pudding mix and chocolate chips is pretty decadent, but since it’s mixed with whipped topping the recipe is light and airy. So beware, ’cause you can devour a large helping with ease (I would know!). 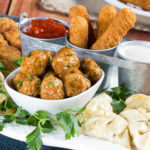 Be sure to check out these other yummy fluff recipes. Potluck Pistachio Fluff – Here’s a more classic version of the kind of fluff I grew up on. It’s made with pistachio pudding mix, fruit cocktail, and nuts. “That Cherry Stuff” – An oldie, but a goodie. 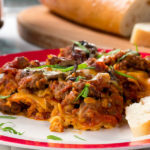 This scrumptious recipe uses thick cherry pie filling instead of pudding mix, and it’s one of the Mr. Food Test Kitchen’s most-loved recipes! 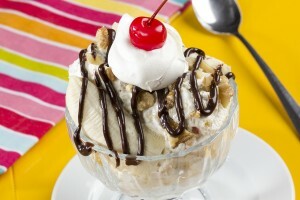 Banana Split Sundae Fluff – All the flavors you love in a banana split, made into a fluffy summertime delight. Now that’s a way to make family sized sundae! Poolside Party Fluff – This fluff has every summer flavor you could possibly want. Yummy coconut, pineapple, nuts, fruit cocktail and more. Plus, it uses an extra special pudding mix! Have you ever made fluff? 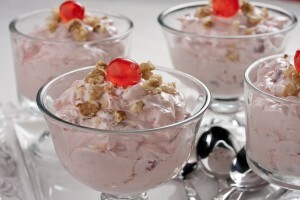 Years ago I made a version of “fluff” that started with a Graham cracker crust, a package of hello prepared according to package directions and turned into a thawed frozen whipped topping, then either fresh prepared fruit, our favorite was strawberry with crushed pineapple a close second. Once prepared it needs to be chilled for at least 2 hours before cutting into squares. Haven’t made it in years, and I am surprised I remember it at all. It was always a hit at neighborhood gatherings.